I forgot to touch base about the Golden Globes in yesterday’s post. Every year, I’m usually really emotionally invested in who wins what, but this year, there were only two people I really wanted to win. The fact that I’m remotely invested in any of this is pretty sad, but what can I tell you, I love celebrities, movies, TV, and entertainment in general. I’m definitely a Netflix marathoner and have wasted many-a-paycheck on the tabloids. Anyway, I really wanted Leonardo DiCaprio to win best actor for The Revenant and I wanted Jennifer Lawrence to win best actress for Joy. So yea, I was happy! If you’re an entrepreneur, go see Joy. I was really inspired by her acting, her story and just her pure drive to be successful and make something of herself, despite a series of seriously unfortunate events and odds. 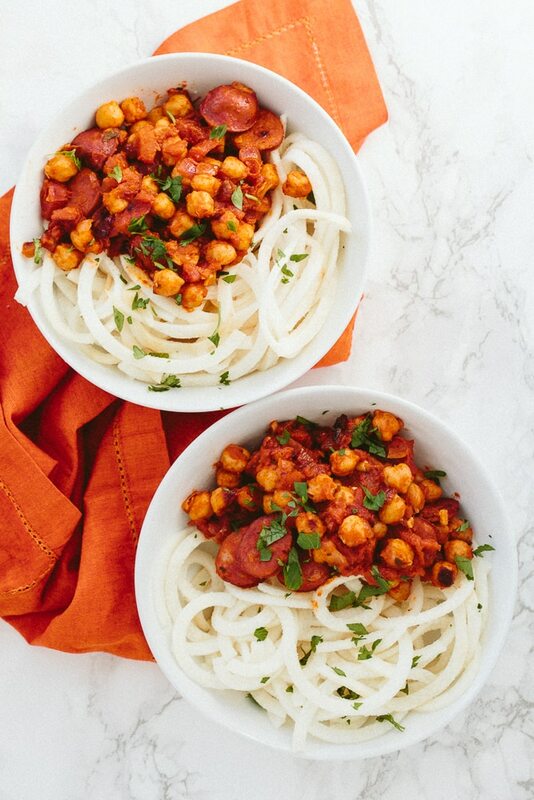 On to this recipe – this dish is meant to be a spicy, flavorful chunky stew that’s served over jicama noodles, sort of like celery is served with buffalo wings – you need something crispy and refreshing to balance your palate. If you don’t want the noodles cold, you can heat them up in the skillet before serving – do you, it’s your preference! Place a large skillet over medium-high heat and add in the oil. Once oil heats, add in the onions, red pepper and garlic and let cook for 3-5 minutes or until onions are translucent. Add in the chorizo and let cook for another 2 minutes to let the chorizos release their flavor. Add in the chickpeas, tomatoes, broth, oregano, bay leaf, paprika, harissa, cover with a lid and allow to simmer for 15 minutes or until sauce is thickened. Taste and adjust with more salt, if needed. While the mixture cooks, peel and spiralize the jicama using Blade C. Trim the noodles with a kitchen shear and divide into bowls. 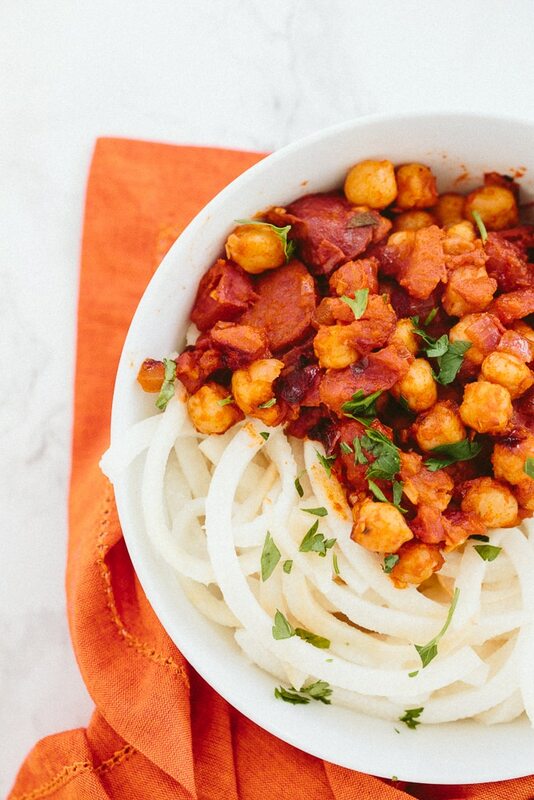 When chickpea mixture is cooked, top each jicama bowl with the mixture and garnish with parsley. I love award show season! I'm old so I was rooting for Stallone. He made me laugh and cry in Creed! 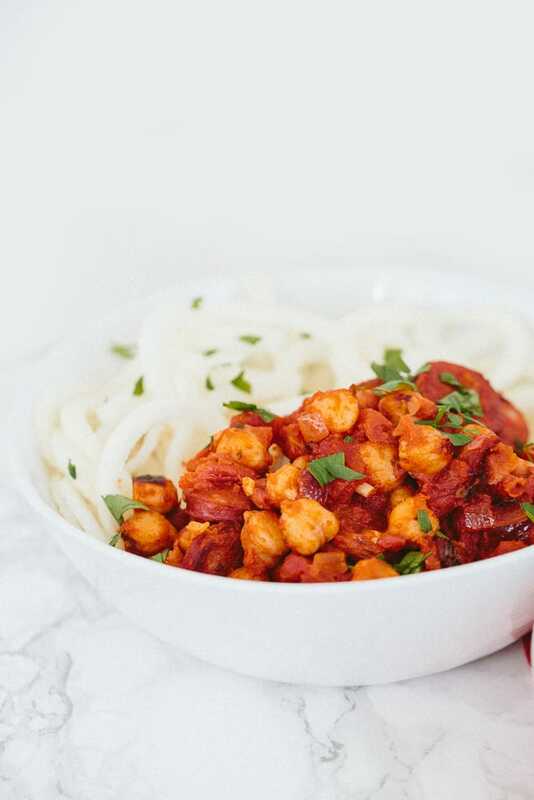 We have a terrible time finding anything other than ground chorizo, but this recipe makes me want to renew our efforts. Sounds delicious! 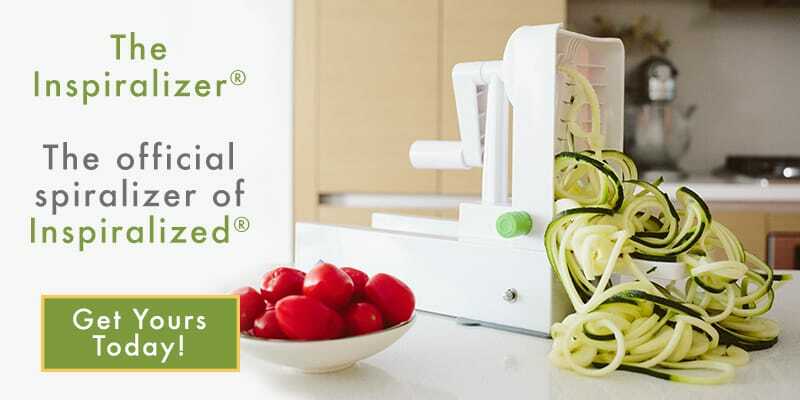 Is there something else I can spiralizer instead of the jicama? I can't seem to find that! Kohlrabi would work really well here! Could you possibly show a picture (some time) of your Chorizo before you slice it, or even before you take it out of the package? I don't think I have the kind you use in my stores, but I'd love to see the package and know what I'm looking for. Thanks. 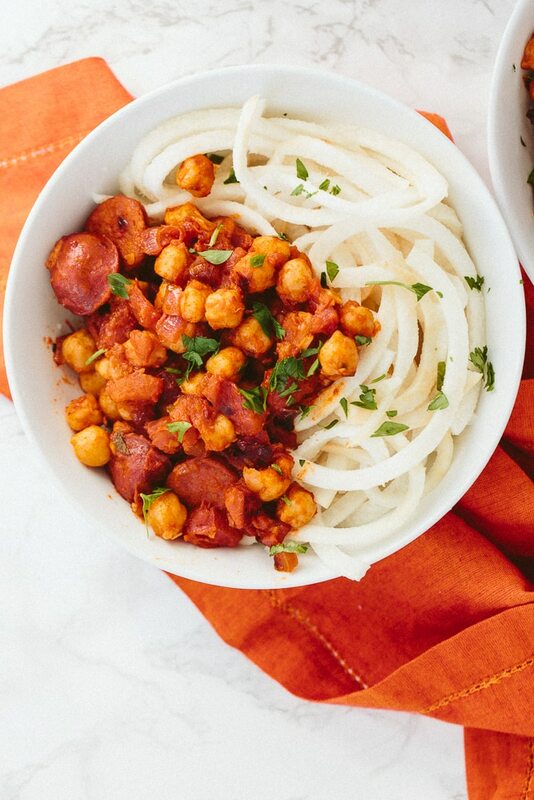 Any chorizo links will work! They look like regular sausage. Just made it tonight and it turned out great. The jicama added a great texture and freshness to it. Also, we used the Trader Joe's soy chorizo, and although it was more of the ground style, it turned out great and kept the fat content down. Thank you! Thanks for the review - and I like the idea of soy chorizo! I wish you would incorporate the nutritional information of your recipes into the print versions!!! PLEASE do...I think many people track their food these days through various sites (fitbit, myfitnesspal, weight watchers, etc) and this information is so helpful! Thanks!! We loved this. I'd never had link chorizo before as out here in the West it normally comes like ground beef and has a different flavor. Found the chorizo at a Columbian market. There is no jicama in the uk (grrrrrrr) - would you think this would taste okay over a spiralized granny smith apple?